The Sacramento Delta has produced some of the finest hot rods and custom cars ever made. The passion of the area's builders is evident in the incredible cars they created, which drew nationwide attention. Harry Westerguard, who taught George Barris bodywork, worked on the second ... read full description below. 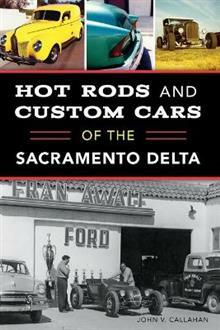 The Sacramento Delta has produced some of the finest hot rods and custom cars ever made. The passion of the area's builders is evident in the incredible cars they created, which drew nationwide attention. Harry Westerguard, who taught George Barris bodywork, worked on the second America's Most Beautiful Roadster ----a 1923 T that was a style-setter for its day. Bob Dron built his first custom when he was only fifteen and a half, and Lenny Byer created his own Candy Apple Red in Rio Vista. Detroit might have had its vision, but the Delta region built its own. Discover the stories behind the cars and their builders as author John V. Callahan takes us on a trip down memory lane. John V. Callahan published his first hot rod articles, the monthly Callahan's Car Corner, in 2003 with the River News Herald. He grew up in Rio Vista and Lodi and served three years in the U.S. Army before returning home and attending San Joaquin Delta College. He worked for the United Parcel Service for thirty years. He enjoys bird carving, hot rod building and several volunteer programs in Lodi, including being chairman of the Art's Commission in 2005 and 2006. This is his first published book.